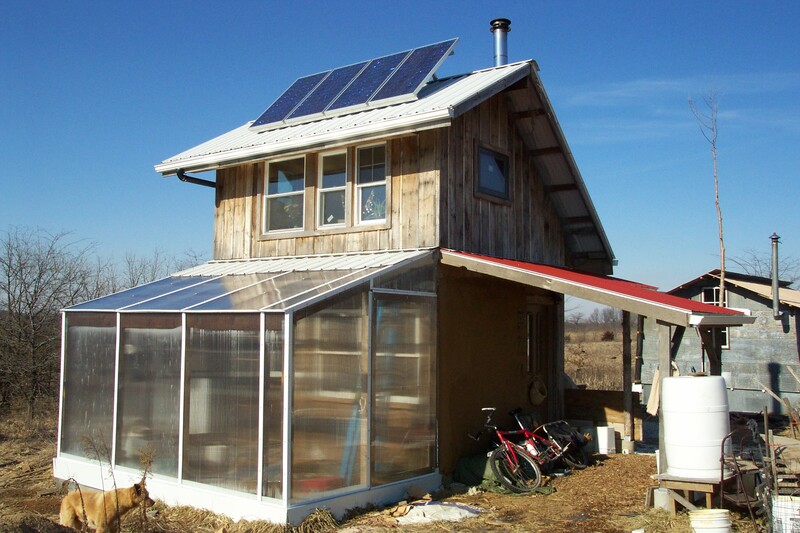 Using less energy in your home starts with good passive solar design. By orienting buildings with windows to the south and appropriate shading homes can be heated by the sun in winter and kept cool and breezy in the summer. By providing for high levels of insulation and sufficient thermal mass, heat can be moderated and stored in your home through the night or through a cloudy day. Insulation and mass also help moderate summer heat making a building more efficient year-round. At DR we generally have homes much smaller than in the wider culture which not only means less energy to build them, but much less energy to heat and cool them. We also keep temperatures moderate, setting thermostats (or the equivalent) in the mid 60s in winter and the high 70s in summer. Currently, almost all our heating that doesn’t come from the sun is supplied by burning firewood. We collect waste wood from local sawmills and furniture factories that is often otherwise burned in useless open fires. Some firewood is gathered from our land or purchased locally. Some small amount of heating is done with renewable electricity, usually at the scale of a foot warmer or personal space heater. With our new BEDR Power Co-op we expect to see more heating with ground source heat pumps or other super efficient electrical heating sources. Heat pumps could also allow for cooling and humidity control in the summer months.